XHTML is most often used nowadays to code websites mainly because it is reliable and more dynamic. Web design layouts are regularly done in PSD format and then converted to markup language. The creation of a PSD and its conversion to any variant is an important design constraint. 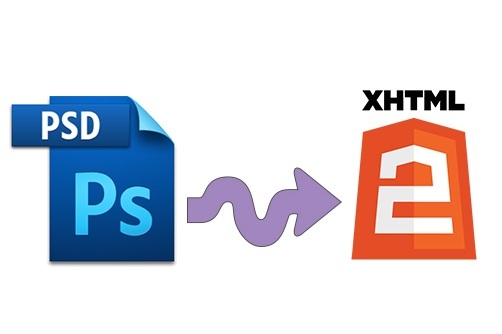 There are many advantages when PSD is converted to XHTML and we will discuss top 5 of them here. A layout that is free of any constraints like tables is far more dynamic than the primitive types. Images and video bars can be placed without any hassles if a tableless design has opted. Efforts to be put are minimal when images are placed in such pages. XHTML greatly supports backward compatibility and cross-browser checking to ensure that different versions of the same or different browsers do support the content which is a really slick feature. It is an important parameter considering the ultra-modern age we are going through where mobile devices and tablets are swiftly replacing desktops. Search engine friendly markups are easily achieved using semantic coding. Manual coding and picture-perfect webpage designs ensure better SERP ranks. Density and regulated occurrence of keywords play an important role in SERP ranking. Companies offering HTML conversion services do argue about significantly high rankings but nowhere near XHTML pages. Visibility is an important parameter while checking for web accessibility. Websites need to be simple, lightweight and effortlessly noticeable. The content must be wholesome at the same time while it is simple. Error-free and reliable websites are most often bookmarked than those with richer but buggier content. Loading speed of elements greatly depends on their number and parameters like resolution, image size, external videos etc. Don’t hesitate to remove elements which you feel are of no use but provide only aesthetic feel. Since most of the XHTML documents go through a simple process of W3C validation, it is always better to stick with the most popular format. XML conversion can also be helpful to an extent. XHTML is recommended by W3C, so it is recognized by W3C. Validation of such recognized websites is easy because they are reliable and error-free from a developer’s context. Users of a website always consider services and products online. Online businesses rely a lot on their website performance since it determines the economic conditions. XHTML conversion plays an important role in regulating the quality and density of keywords in the content. These advantages signify the importance of PSD to XHTML conversion for more reliable and hassle free developer solutions. Finally, be careful while hiring the service providers.